Take the train to Köln-Ehrenfeld. There are several cheap rates offered by Die Bahn: e.g. the Schöner-Tag-Ticket (27€ for 5 persons, but only inside NRW, and only on work-days) or the Gruppe&Spar (drive in groups with at least six persons, discount up to 70%) and, for a limited time: Sommer-Spezial and Sommer-Spezial International. If you're planning to come via train from abroad, simply check the homepage of your national train company. Take the S12 (direction Horrem or Düren) or S13 (only on Friday, direction Horrem). After six minutes you will arrive at Köln-Ehrenfeld. Exit there. The tickets for this trip are called "Cityticket 1b". They cost 2,20 Euro, you should have coins handy. Take the S12 (direction Horrem or Düren) or S13 (only on Friday, direction Horrem). After nine minutes you will arrive at Köln-Ehrenfeld. Exit there. 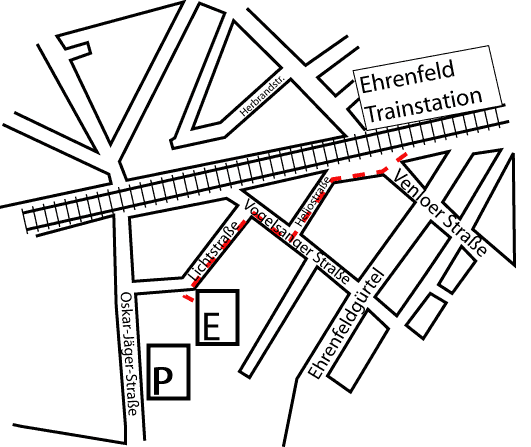 At the station Ehrenfeld, take the exit '''Venloer Straße'''. Cross Venloer Straße and follow Heliosstraße to its end. Turn right and after some metres left again into Lichtstraße. It's about 500m to the location, a red house indicated with a large sign '''Vulkan'''.